"Dear self... today I will Shine". Chart offers 2 different stitching options - choose your favorite shape. Fabric included is adequate for whichever choice you make. Pattern includes lovely 32 ct. Red Pear linen, embellishments for sampler and bitty BONUS design. 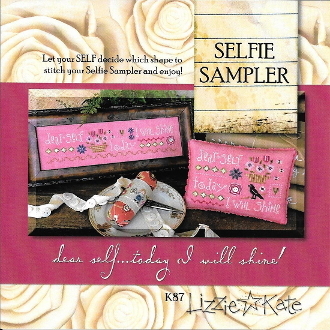 Lizzie Kate also included finishing instructions for the Selfie Sampler pillow and bonus project. Finished design size framed: 9.4" x 2.1" ﻿ with a stitch count of 151W x 34H. Finished design size Pillow: 5" x 3.5" with a stitch count of 80W x 56H. Instructions given using Weeks Dye Works threads with conversions for DMC embroidery threads (not included). Needles and Threads are not included.